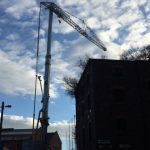 Last week we erected a new Potain Hup 40-30 in Liverpool on a warehouse renovation project. 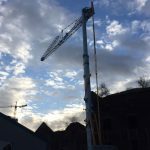 This is one of the Potain Hup 40-30 Self Erecting Tower Cranes that we added to our fleet earlier in 2017. These are unique cranes that can provide a height under hook of 30m at the end of 40m jib, where it can lift 1,000kg. Closer to the tower, and out as far as 13.2m, it can lift a capacity of 4,000kg. 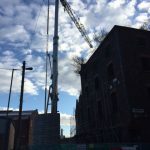 The project involves the renovation of a warehouse with a first floor extension and parking to provide office space with meeting rooms, reception and lobby. 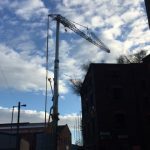 To find out more about hiring a Potain Crane in Liverpool contact us today.